At about 11:50 a.m., ten minutes before check-out time at my hotel, I ran a quick errand up to Rovaniemi’s main square, which used to be called Sampo Square, which is the name of a bank. It’s now called Lordi’s Square, after the heavy metal group that has been adopted by the chamber of commerce here in Santa Claus City. Times change, eh? 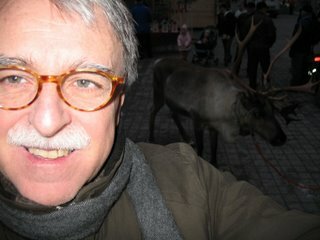 Imagine my surprise when I encountered a reindeer, tethered in the heart of Lordi’s Square and surrounded by a score of curious on-lookers. Most of them, strangely enough, seemed to be locals. I’m not sure where all the Japanese tourists were when I was making a spectacle of myself, trying to frame my face with the reindeer over my shoulder. I’m afraid all the light ended up on me and left Donder over yonder in the semi-darkness. You can just barely make him out if you squint. Reindeer are shy creatures, and the vibes I got indicated that Donder didn’t care much for the flash. So it all came down to one low-percentage shot, a long three-pointer at the buzzer. I nearly nailed it. After its complete destruction by the Germans in 1944, it was rebuilt from a plan by Alvar Aalto, with the main streets radiating out from Hallituskatu in the shape of reindeer antlers, though this would only be obvious from the air. First, let the record show that the reindeer antler plat would not be obvious from the air, any more than it is from a map. If you were to take a highlighter and use it very selectively on the city’s streets, I suppose you could produce a pattern that looked like reindeer antlers. I don’t doubt for a minute that Aalto saw reindeer’s antlers in the city’s streets, but then, as I learned years ago from good ol’ H. W. Jansen, Pablo Picasso could see a bull’s head in an old bicycle seat and a set of handlebars. But having a good eye is not the same thing as executing a “plan.” There is, too, the question of why a world-class architect not known for his egotism would impose a conceit of this sort on a client, especially one that happened to be an entire city. My heart skipped a beat when I walked into the Rovaniemi room at Arktikum and saw what I immediately recognized as a city model, much like the model of Oulu that captured my fancy at the Museum of Northern Ostrobothnia. Then I noticed that there was actually a second one right next to it, and sure enough, both are models of Rovaniemi, one in 1939, the other in 1944—before and after the devastation wrought by the retreating German army. And they were done to the same scale. Nearby, in the same room as the models, there is a TV monitor on which a film about the destruction of Rovaniemi runs on a continuous loop. The narration is in Finnish, but there can be no confusion about the story line, which has to do with the physical and human toll exacted by the leveling of this city. Much of the film looks as if it came from a government archive, but some of the footage appears to have been borrowed from home movies. It is apparent that there were, as always, romances between the soldiers and local women, some of whom are shown holding babies. The film ends with footage of cement mixers and bare-chested men shoveling the wreckage away. The film is riveting. Afterwards, I looked around for an exhibit on Aalto’s reindeer-antler master plan. If there were anything to the story—anything other than a casual epistolary reference, maybe—surely it would be exhibited here, in this room, with the models and the film. But it’s not. I asked a tour guide if she knew the source for the story about the reindeer antler plan. She said she didn’t, and she said that she suspected it was not a “plan,” as such, but probably a “literary” reference. Even then, a direct and explicit “literary” reference would be well worth displaying—unless, of course, it were off-hand to the point of undermining the claim. I came away from Rovaniemi with more doubts than ever about Aalto’s alleged Big Plan. I also came away with a better understanding of the scale of Helsinki’s effort to avert the depopulation of the Finnish countryside. A comparison might help to convey a sense of the scale here. The population of Rovaniemi is roughly 35,000—about the same as that of Hagerstown, Maryland. Hagerstown, of course, is not a state capital. It doesn’t have an air force base. It also doesn’t have a major museum, or a university. God knows it doesn’t have a concert hall, let alone one built by a world-famous architect. It has a library, though. I checked, just to make sure. 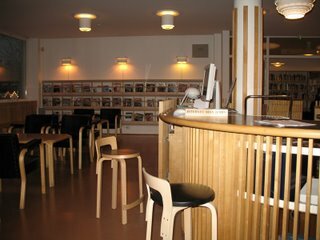 My impression is that the Finnish government has largely succeeded in making provincial centers such as Rovaniemi desirable places to live, with the result that young people do not think that they have to move to Helsinki, or the south, generally, in order to have a decent life. Finnish university graduates seem to be willing to relocate to wherever the jobs are. But all things being equal, they would prefer to stay close to hearth and home—in Oulu, or Rovaniemi, or wherever. Not that Helsinki is winning any popularity contests as a consequence. I told a colleague that I was planning to spend some time in Helsinki at the end of the semester. "That sounds like fun," he said, but then he qualified that by saying that people in Helsinki aren't as "genuine" as people in Oulu. From such incidents I infer that people in the provinces have an ambivalent attitude toward the national capital, and I suppose that's true of the United States as well.